Home Daughtry is Chris Daughtry's band, who was the 4th runner up in American Idol 2006. "Feels Like Tonight" was released in January 8 2008. 9 Apocalyptica 1. 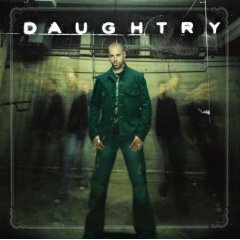 It's Not Over Chris Daughtry, Gregg Wattenberg, Mark Wilkerson, Brett Young. 24 Celine Dion I did a quick google on producer Howard Benson and found he has also worked with Motorhead, Papa Roach, My Chemical Romance, Hoobastank, P.O.D., Santana and Mark Ronson and more. 31 Dede Gregg Wattenberg also produced Backstreet Boys' 'Weird World' and has co-written songs for Five For Fighting and Chantal Kreviazuk. 33 Drain Mark Wilkerson is the lead singer and guitarist for rock band Course of Nature. 42 Glee Ben Moody and David Hodges used to be in Evanescence and wrote 'Because of You' sung by Kelly Clarkson.